For my Minecraft cake I made an 8 inch chocolate cake with homemade chocolate frosting and a 14 inch white cake with homemade buttercream frosting. All the decorations are homemade out of fondant and edible (with the exception of the seven white candles.). I made this cake for my Seven year old Minecraft loving Grandson’s Birthday Party. I hope he likes it! 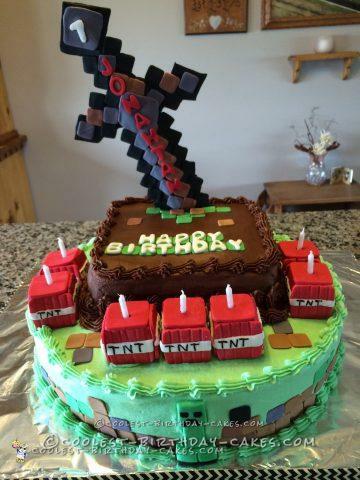 This Minecraft cake was a lot of fun to come up with and to make, it was kinda time consuming but actually pretty easy to make.